At Weber Automotive, our qualified mechanic has had over 24 years experience working on all types of motor vehicles. He specialises in 4WD’s and enjoys working on these types of vehicles so much that he owns one. With the experience of not only working on thousands of different types of 4WD’s throughout his career, he can also draw on his own personal experience of owning a 4WD. 4WD’s are fast becoming the vehicle of choice for not only the avid adventurer but also for your small to medium families. With a 4WD you have the space, comfort and range of aftermarket suspension to choose from to improve both the handling and comfort of your drive. Having good quality aftermarket suspension system also allows you to venture across all terrains and tackle more challenging locations if your heart desires. The common question that people ask if they purchase a brand new 4WD is “Why would you change the performance suspension system?” The simple response is when you start adding accessories (bullbar, towbar, roof racks, lights) and baggage to your 4WD, the performance and reliability changes on the road. By adding good, quality and professional aftermarket performance suspension system to your new 4WD, you will not only improve vehicle handling but road comfort too. 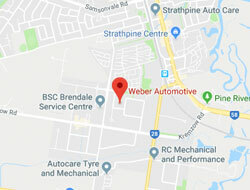 Call Weber Automotive to discuss your 4WD Performance Suspension needs on 3205 7122 or 0417 616 118. Contact Weber Automotive to discuss all your 4WD Suspension needs…….